For many (or some) of us that were subject to intensive Holocaust conditioning as kids in American public schools, we saw films of hundreds and thousands of piled bodies from old WWII footage a few times a year ~ year in, year out. We were told they were Jews that had been murdered, gassed mostly, by the Nazis. I recall seeing my first one of these films in the early 1970′s when I was about nine or ten years old. As a kid, I always felt a little sledge-hammered after being subjected to those movies in the darkened classroom, surrounded by my fellow students with the teacher sitting in the back to keep an eye on us to make sure we didn’t fool around or otherwise be distracted from the Important Information that was being injected into our still-forming minds. Dark rooms under veil of authority are very conducive to making certain that attention is given to what’s to be taken in. What was being funnelled into our brains was a steady diet of grainy black and white movies of Jews being herded through towns like cattle, bodies being bulldozed into pits, mass trench shootings, prisoners that looked like the walking dead, emaciated corpses piled like firewood. If you had a similar experience in school, you know of what I speak. Then there was usually some kind of after-lesson given by the teacher when we were at our most traumatized. Bad Nazis. Nice teacher. And we all took it in, without question. Six million Jews died in gas chambers, were made into soap, burned in ovens. Four million Jews died in Auschwitz. Nazis made lampshades out of Jewish skin. Gas chambers in Germany. 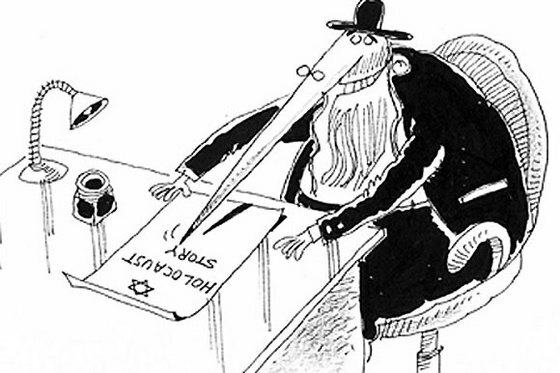 And thus was the core of my childhood education of the Holocaust. I never questioned what I’d been taught. I had no reason to. Leaving any idea of academia behind in 1980 when high school was over, I went along with my merry little life and, to be honest, I didn’t think much about the Holocaust again. That changed for me in the late 1990′s when I learned, via the internet and my own research afterwards, that the number of dead at Auschwitz had been revised downward from four million to one million, but the overall six million Jewish dead still stood as gospel. Or maybe five million as of now. It was six million no questions asked when I was a kid. Anyway, over time I also learned that the soap stories had been deprecated, Jews hadn’t been made into lampshades after all and there hadn’t really been any gas chambers on German soil. Having to unlearn this new information was coupled with learning that people were being charged with and going to jail for having the wrong opinion about history when it came to the Holocaust by publicly stating that there was no evidence for mass exterminations of Jews by gas chamber. Frankly, life was easier before the blinders came off. What had all of these people done to the Holocaust stories of my youth? We all know what a gas chamber is. It can be defined. We know them from 1930′s gangster flicks, Perry Mason shows, etc. For better or worse, gas chambers have been a meme for decades, even before World War Two. The first person executed by gas chamber in the US was a native born Chinese named Gee Jon in 1924. The last person executed by gas chamber in the US was in 1999, a German national named Walter LaGrand. Life’s funny like that. 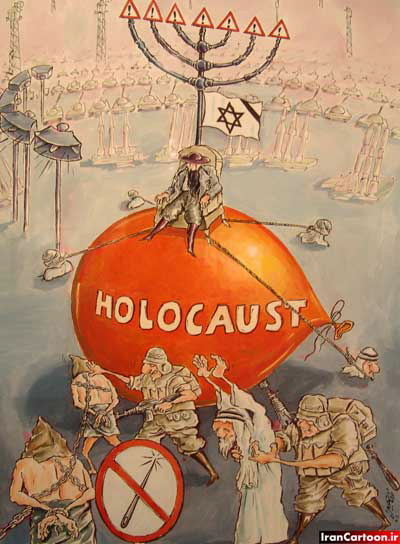 It’s difficult to find a hard and fast definition of the term holocaust denial, though the term is used on a daily basis in the international media. As an aside that might have meaning or not, a google search for gas chamber yields fewer results than a google search for holocaust denial. I’ll leave it to the reader to pull that one apart. So is there evidence of mass extermination of Jews by gas chamber? There’s much eyewitness and anecdotal evidence. There’s Yankel Wiernik’s “A Year In Treblinka”, published in 1945. In it, he claims that 1200 people were put into rooms that were about 400 square feet and gassed. This displays one of the difficulties of anecdotal evidence. Fitting 1200 people in what is essentially a small garage is a little difficult to imagine. The most approachable analysis I’ve found is David Cole’s “The Truth Behind The Gates Of Auschwitz” (Part I, Part II). Cole’s Forty-Six Important Unanswered Questions Regarding the Nazi Gas Chambers is also helpful. In it, he asks the simply legitimate question, “If you don’t know whether there were three or four holes, how do you know that there were ANY holes?” It should be noted that Cole, who is Jewish, was apparently forced by threat and blackmail by the Jewish Defense League into recanting his research and withdrawing from ever speaking of the Holocaust again. How many Chinese died in World War Two? How many Russians died in World War Two? How many Americans died in World War Two? How many Jews died in World War Two? You most likely know the answer to #4 without having to look it up. Most of us would have to look up the other answers too. I guess it was more important for us to learn some things rather than others. It took me until a couple of years ago to realize that our conditioning is so deep that when the programmed individual is asked to consider what evidence exists for gas chambers, what the programmed individual hears is, “No Jews were killed by the Nazis”. That’s exactly how the programming is supposed to work. It makes possible the use of the term ‘Holocaust denier’ to keep the unconditioned sheep out of the fold. In High American Culture of the 21st Century, there’s few greater curses thrown than that of “Holocaust Denier”. It’s gotten people deported and jailed in foreign countries while multi-billion ripoff artists are sentenced to their mansions. This conditioning is often protected through an emotional reaction. Many people get downright angry when gas chambers and evidence are brought up in the same sentence. We see this same reaction in people that have an overarching attachment to religious or political systems also. It’s not a rational, reasoned reaction to a rational, reasonable request. For others, the reaction is one of apathy. Apathy protects the conditioning by ensuring that the source of the conditioning won’t be examined and thus, the conditioning remains. This Holocaust conditioning is the vice-grip of a perception that lends itself to much evil being allowed to happen. By at least examining what one thinks one does or doesn’t know about the Holocaust, that grip is broken just a little bit and perception can be allowed to change rather than dictated to. Jew worshipping leads the worshipper into the dimly lit pit of hell...JEWTOPIA. KNOWING THE TRUTH is the exact opposite of "JEW" worshipping.